퇴계 이황(退溪 李滉, 1501～1570)은 조선시대가 배출한 탁월한 학자이며, 동시에 영남학파의 종장(宗匠)이다. 퇴계가 그러한 인물이기에 그의 학문적 성과를 집성한 문집인 ｢퇴계선생문집｣의 가치 또한 높다. ｢퇴계선생문집｣은 그 내용의 풍부함이나 분량의 방대함은 물론, 이를 편집하고 간행하는 과정에서 구축한 문집편집의 방법과 성과가 조선후기 문집의 편집과 판각의 전범(典範)이 되었다는 점에서 매우 중요한 의미를 갖는다. 지정 대상본은 ｢퇴계선생문집｣의 초판본으로, ｢퇴계선생문집｣이 판각되던 시기에 초래된 여러 곡절과, 오랜 진통 끝에 판각되면서 안게 된 제반 문제를 모두 보여준다는 점에서 한국 문집의 연구에 중요한 자료가 되고, 다양한 장서인과 장서 관련 묵기(墨記)는 장서의 변천에 관한 연구의 좋은 사례가 된다는 점에서 지정가치가 크다. Toegye seonsaeng munjip (Collected Writings of Toegye) is a collection of literary and academic works written by Yi Hwang (pen-name: Toegye, 1501-1570), who was the head of the Yeongnam School of Confucianism, and is generally regarded as one of the greatest Neo-Confucian thinkers of the Joseon Dynasty. 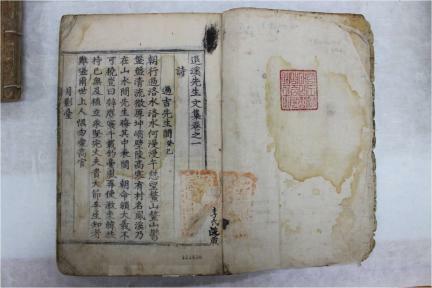 This particular book is a copy of the first edition, and is notable for containing a variety of distinctive features that reflect the long, difficult process preceding the final decision on its publication, and which now constitute an important resource for studies on the writings of the Neo-Confucian literati class of Joseon published in book form. The various imprints of studio seals printed by its collectors and their postscripts are also regarded as a valuable source of knowledge on the Korean tradition of book collection.